First Listen: Django Django, 'Django Django' The Scottish band's debut mixes surf-rock, Motown, blues, cosmic space-pop and even Egyptian music. The result sounds like '80s music reconfigured for the 21st century — and one of the year's most thrilling, endlessly refreshing surprises. 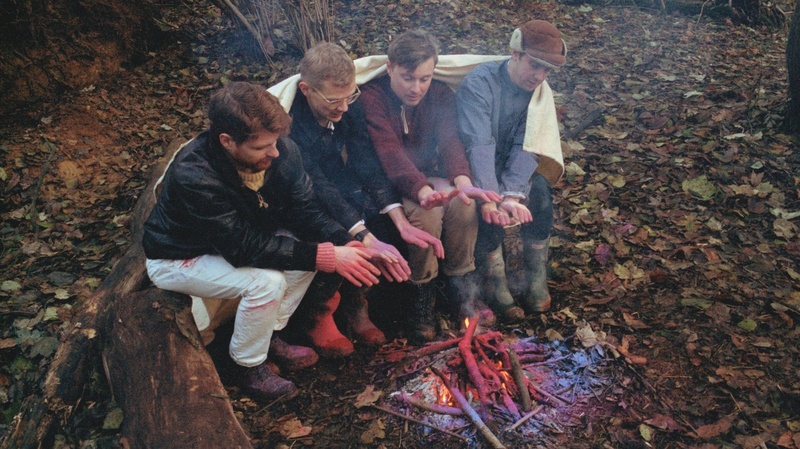 Django Django's self-titled debut comes out digitally on August 14. If the self-titled debut from Scotland's Django Django sends one clear message, it's that the '80s are back and bigger than ever. It's all in there: the angular analog synths and choppy new-wave guitars and dance beats, all painted in flamboyant bursts of sonic joy. But Django Django, while undeniably catchy, is more complicated and layered than the totally tubular pop you might have heard 30 years ago, and it's got the momentum of a runaway rocket. The album's 13 cuts pass by so quickly, and grab from so many styles and genres, there's scarcely enough time to make sense of it. In the opening seconds alone, you'll hear the sound of crickets on a steamy night, followed by the electronic trills of a Pac Man video game, the whoosh of a spaceship taking off and, finally, a pulsing synth and whistled melody, like something out of a futuristic spaghetti western. At this point, you're about 50 seconds into what's already one of 2012's most thrilling records. The four guys in Django Django — who insist the name has nothing to do with jazz guitarist Django Reinhardt — met at art school in Edinburgh a few years ago and started making home recordings together after migrating to London. They released a couple of singles in 2009, "Storm" and "Love's Dart," then spent the next three years piecing together cuts to form their first full-length album. If you grew up in the '80s (like me) and loathed much of the popular music (as I did), Django Django ought to make you rethink everything — or maybe the band is only showing what's possible with a palette of sounds from the '80s, reconfigured for the 21st century. Regardless, Django Django, out August 14, is an endlessly refreshing surprise.